How do you return to “normal” after something so heavy? I wanted to sit down and write yesterday, but was feeling in a funk. I supposed that there will be many days like that for a while. We have been getting back into our normal routine. We took last week off of homeschooling. I was feeling guilty, when a post from a facebook group popped up. Someone asked the question about homeschooling in crisis and what that looked like for other families. The overwhelming response was that it was ok to take a pause. Part of educating our kids is teaching them empathy and compassion. This IS real life- more than math problems and matching games. I am really glad that we took a short break to grieve our loss and deal with those emotions and questions. It also freed Scott and I up to be with family and help out where we could. I still feel like I have writers block. Perhaps it is the sinus junk that I seem to have woke up with. You know when you breathe and your nose whistles? Yep. I know, I know. Scott is a lucky man to have this glamorous woman for a wife. HA! Don’t be jealous. Harper sounds yucky also. I’m praying it’s just the sudden shift from 90 degrees to 70. Thieves will be my best friend either way! We have less than a month until Addi turns SIX! What?! I am trying to figure out her birthday party plans. She wants a unicorn party, of course. She decided she wants her cake to be purple for her Papa. We are going to look for ways to incorporate his memory into her birthday. I know he would be thrilled to be remembered in a unicorn. HAHA! I promise I’ll quit rambling on here soon!! Ugh. I want to give a quick shoutout to my college bestie. She is ridiculously talented and has opened up an etsy shop. You should go check it out and support her! I can’t wait to wear my necklace. She’s a rockstar. We have almost made it through the week!! Come on, Fri-yay! It has been two weeks since the last time I sat down to write a blog post. A lot has happened. I wish that I could say that it has been a lot of exciting things, but it hasn’t. The last time I was here, we had just visited the apple orchard. We had also gone to see my father-in-law while he was in the hospital. He had been in the hospital for quite a while, and was transitioned to one closer to home. He was supposed to be doing some physical therapy to get stronger and be back at home. To make a long story short, he had to be transferred to a different hospital because he was getting worse. Then, very suddenly, things got really bad. He passed away 25 minutes after his 80th birthday had ended. There is some beauty in something so heartbreaking. We got the opportunity to say goodbye. Because he was in the hospital, his condition could be seen. It was obvious when the end was nearing and we got the chance to tell him how much we loved him. Chloe, Addi, and Harper sang him happy birthday for a video I took. I was able to play it in his ear so he could hear Chloe’s “I love you, Papa. You’re the best papa ever! !” at the end. Most people have asked how the girls are handling it, so I will answer that they are doing pretty well. They still aren’t old enough to fully grasp it all. Is anyone? Addi is having the hardest time, because Papa was her buddy. She had plans to save her chocolate candy from Halloween for him, because Papa loved his sweets. She realized that he won’t be there to celebrate her birthday with her next month. Something that some of Jim’s grandsons and I were talking about after the funeral was the way that Jim lived. If you could see all of the pictures from throughout his life, you would get a good picture of the man we loved. He lived fearlessly. He didn’t care at all what anyone thought about him. He wasn’t afraid to do silly things. He just put his whole self into whatever he was doing. He made sure to pull you in and make sure that you were having a good time also. There was a trip that Scott and I were gifted when Chloe was a baby. It was a stay in a condo on Myrtle Beach. We were still fairly young. You had to be 25 to rent a condo like this. So, we called up Jim and Denise and asked if they wanted to come along. Denise had to work, but Jim was free (ah, retirement). We got to spend a week with him making memories. We knew it was a blessing to get that time, but never realized just how much. I have learned something over the past week. It may be silly, but it seems to be significant to so many people. Take the picture!!! I was usually sneaking around taking pictures of Jim with the girls. He was always playing with them. Always. He didn’t like to pose for pictures- most people don’t. I remember taking the picture of Scott and his dad on the beach. Neither of them wanted to do it, but I made them anyway. haha! There are so many people saying that they wished they had more pictures. More important is the just make the memories in the first place. Pictures will eventually fade and can be destroyed. The memories can’t. Tell people how much they mean to you while they are still here. Jim had 80 full years of life. He has certainly left a large hole here on earth. We all appreciate the prayers and love that we have already been shown. Please continue praying as everyone continues to grieve this loss. 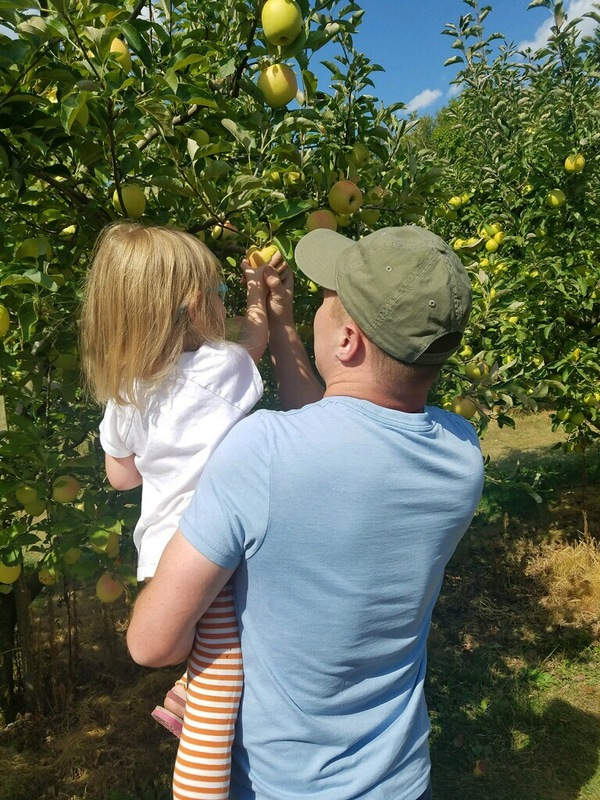 After having the worst garage sale failure ever this weekend, we packed it in and invited my parents to go to Okaw Valley Orchard with us. It was a beautiful warm and sunny day. We went into the store first- obviously in search of apple cider and donuts. 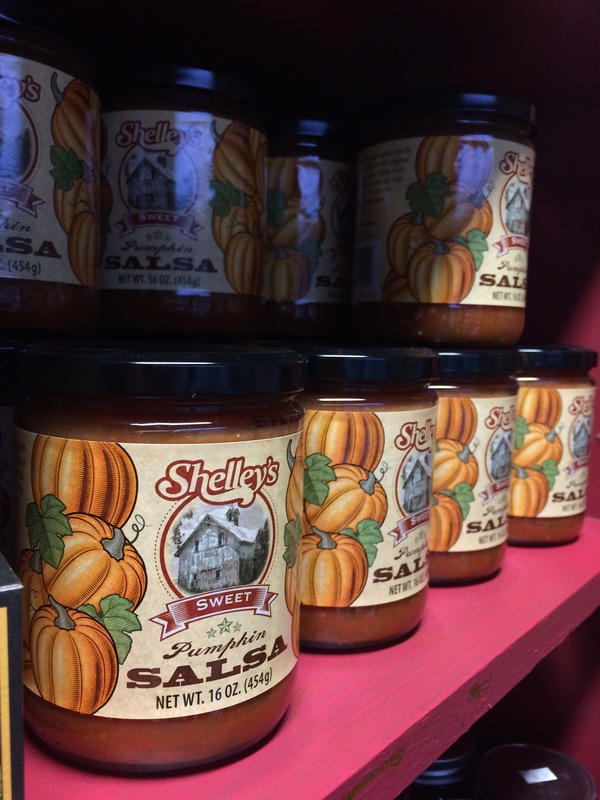 They had so many yummy sounding syrups, jams, and salsas. They also had one last pack of cider donuts and CIDER SLUSHES!! 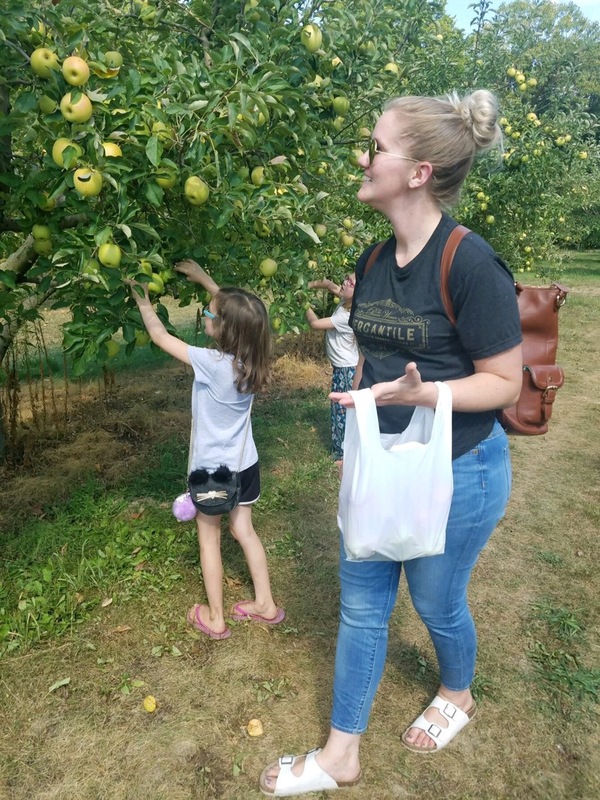 We purchased our bag to get a peck of apples, and the sweetest lady took us out to the orchard. 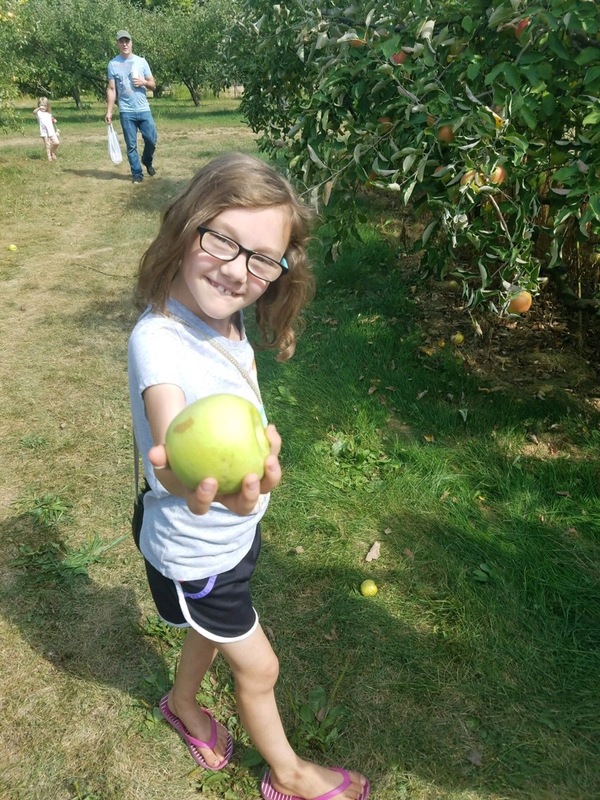 She showed us what apples were ready to be picked, and gave us some history of the farm. They do not use any pesticides on their plants. When the trees are first growing, they put some kind of oil on them to keep the deer from eating them. Definitely my kind of orchard. I was holding our bag, so I did not get any pictures, but thankfully my mom did. I’m sharing hers. Thanks mom! 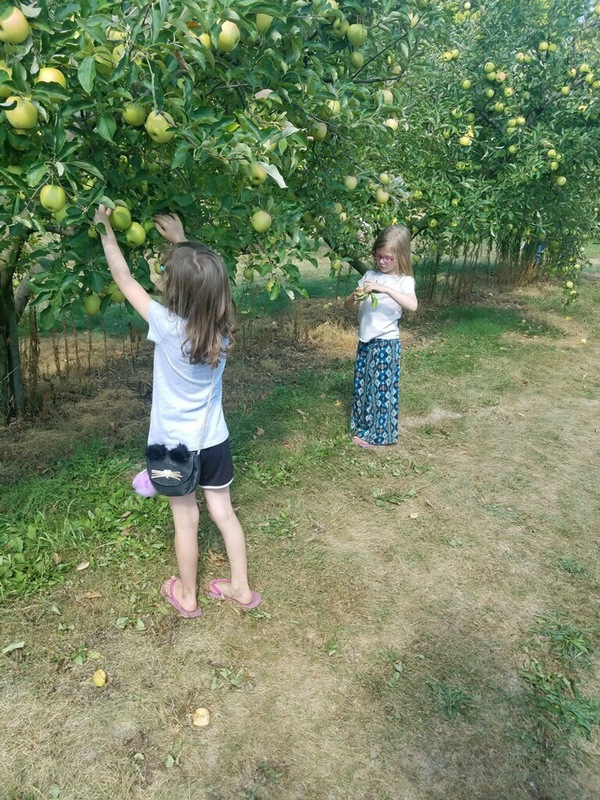 The orchard also had a pretty good sized playground, hay bale maze, and tree house for the kids to play in. The adults sat at a picnic table chatting and drinking cider while the kids played. Scott ended up going around the big playground with Harper because that girl is fearless. 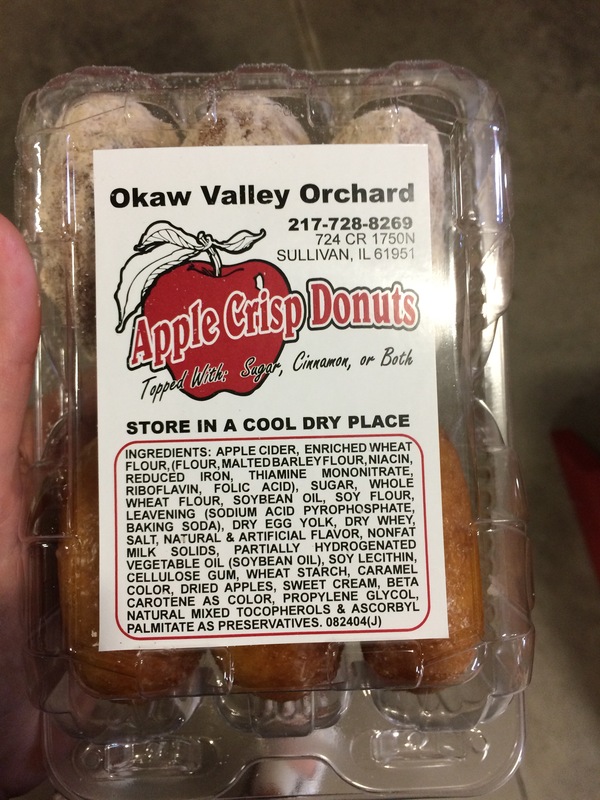 If you live anywhere near Central Illinois, I highly recommend this orchard. It is smaller, so the crowd isn’t out of control. It is family owned and operated. They were all so sweet to us, even with our crazy bunch of wild children. The price per apple is also a really great deal- especially when you think about how expensive pesticide free apples typically are. I cannot wait to go back again! 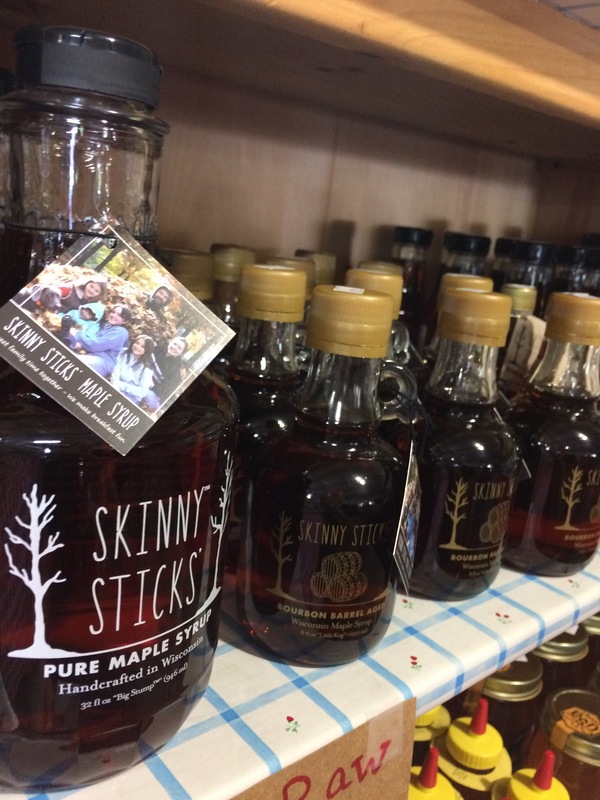 Honestly, I’d go back just to get more cider… and probably some of that delicious looking maple syrup. I know that there are so many people who are skeptical about essential oils. I was one of them. But, after health problem after health problem and doctors not being able to figure out what was going on with my body, I decided to take matters into my own hands. I figured that if nothing else, I got some really good smelling oils to diffuse and they would make my house smell good. I am so thankful that I was wrong. I got my Young Living starter kit back at the beginning of May. I had just got back from the doctor’s office and found out that two of my three kids had strep throat, and that our third would most likely come down with it immediately. Perfect time to put these oils to the test. So, here is how we use each oil. I’m going to put a * by the ones I have replaced so that you can see which ones get the most use. *Thieves: this is such a great immune booster! You can diffuse it, and even add a drop of thieves vitality to your water or coffee. I put this oil in every diffuser in my house when someone comes down with something. Did I mention that strep never got to my third child in that round? (I stopped being diligent about it, and she came down with it several weeks later.. but stopped it from spreading to anyone else then.) You can also make a roller bottle and roll it on the bottoms of everyone’s feet to keep their immune systems boosted every day! Peppermint: This has so many uses, but my favorite is to help with headaches. You can make a roller bottle and roll it on your temples to help ease headaches. You can also just sniff it from the bottle to energize you, or put a drop in your water for some yummy flavor! DiGize: I’m going to be honest. This oil smells SO BAD. But, it works so well!! You know those days where you have eaten something that has your tummy super bloated; or you just eat too much? Rub a couple of drops on your belly and you WILL get relief. DiGize vitality can also be put in your water. Copiaba: This is great for overall wellness. I diffuse this along with thieves and sometimes put a drop in my water if I need a boost. Lemon: Lemon is a great uplifting scent! This makes a great addition to your household cleaners. I also really love to put a drop in my water! *Lavender: This is a soothing oil. I will admit, I did not like the smell when I first started. It was nauseating to me. I have come to enjoy it! A lot of people like to diffuse this oil (paired with cedarwood) to help with sleepy vibes at bedtime. My kids have some crazy opposite reaction to it, but we still use this oil a ton! I put it on booboos as they heal to help soothe the pain. I also was able to rub a couple of drops between my hands and apply it to my in-laws dog’s head to keep her calm during a thunderstorm. I ABSOLUTELY did not believe it would work, but was desperate to help her stay calm. She was still nervous, but not trying to dig a hole in our wood floors anymore! Frankincense: This oil is great for your skin! You can add a drop to jojoba oil and apply after washing to help fight aging. It’s also super grounding! You can diffuse this during yoga or prayer to help you stay focused. *R.C. : I love this oil! It’s so great for respiratory support! You can make a chest rub out of it with some coconut oil. I actually apply this to my husband’s chest and it makes his snoring much more bearable (I love you, Scott!). Last month, I came down with some respiratory illness that my parents had been passing back and forth. Cough medicine wasn’t helping. I finally remembered RC! I diffused some in our bedroom at night and FINALLY was able to sleep without coughing miserably. *Purification: This oil is AMAZING!! You can diffuse this oil to remove stinky smells. I’m looking at you stinky diapers and dog. I like to use it on my wool dryer balls in the laundry to make everything smell good. Panaway: this oil is super minty! You can apply this oil to your skin where you have achy or sore muscles. Be sure to test it first, because this is a hot oil and can feel like it’s burning. If it’s too hot, be sure to mix it with a carrier oil (coconut, almond) and apply where it’s needed. I use this on my hurt knee all the time. *Stress Away: Oh, glorious stress away!! I attached a roller fitment to this bottle and rolled it on my skin daily. Moving and no income is STRESSFUL y’all. This oil smells like paradise! These oils all come with the premium starter kit, along with a diffuser and lots of great resources to help you learn how to use your oils for your family! Thieves household cleaner: you add one capful to your spray bottle and fill the rest with water. It smells so good, cleans really well, and you can know that your kids can help you clean without fear! Progessence Plus: This oil is why I really wanted to join YL! This is great for hormone support. I actually need hormone replacement therapy, already at 29. I refuse to put my body through all of those risks associated with it. So, I’ve continued to feel grumpy, exhausted from insomnia, and a whole other list of issues. Enter this magnificent oil. 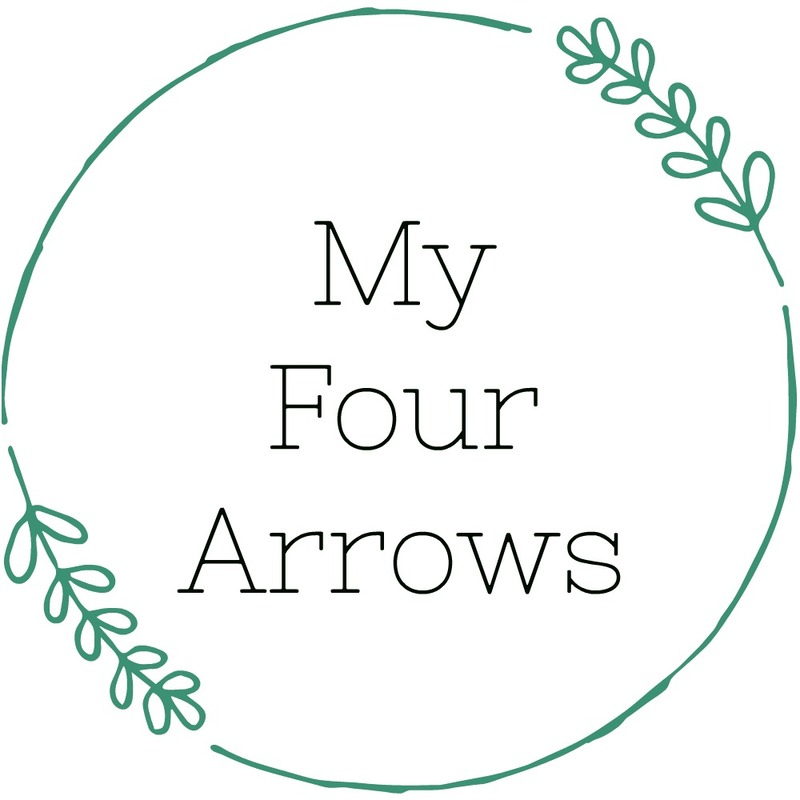 I put 4 drops to my forearms and rub them together. My mood has improved, and I can tell when I have forgotten to use it. I can fall asleep at night without taking ambien! No more random etsy purchases showing up at my door. Valor: This oil is called our “brave oil”. I used this on the girls during our move. It helps keep emotions in check. One of my daughters has really high highs and really low lows. Sometimes her emotions overwhelm me. With this oil, she was able to stay calm when she otherwise would have had a meltdown. Christmas Spirit: This smells like Christmas. Need I say more? If you have any questions or would like to know more, I would love to answer them for you! They have truly been a blessing in our family! As a wholesale member, I get a discount on products and sign up for Essential Rewards, which I will do another post about! You can also go here if you want to check it out for yourself. Going into last weekend, I was determined to have a good time and find rest. We have been spinning our wheels since we moved from Oklahoma, and we are weary. Everyone is cranky. Plus, it’s SEPTEMBER. I know it’s not technically fall, but who cares. It’s fall in my mind. Friday evening we had our traditional pizza and a movie night. We tried a new pizza place that is near our house and it was pretty good! I missed out on the movie (darn, I missed more Paw Patrol) and went to Sam’s club with my sister. It was like a mini-vacation. We read Mother Bruce and laughed so hard we were crying. Scott worked overtime on Saturday, so we took it pretty easy. I had a meeting to go over some things for the new kids program at church. (I’m really excited about it!) I honestly don’t even remember what we did that evening, which was truly our goal. We decided to go to a local frozen yogurt place in town. I was so grateful that they let me bring in dairy free ice cream for Harper. I put it in a bowl and she got to be a part of everything while still being safe. We had a lot of fun until one of our children threw a massive fit because she “didn’t get enough” ice cream. Seriously.. how do you keep your kids from having an entitled attitude. I’m so tired of it. Monday we beat the heat and went for an early hike. We took Rocci this time, and he was happy as could be exploring the trail. We even saw a baby snake. I didn’t even cry. HA! I do NOT like snakes, but put on a brave face so that my kids don’t inherit my fears. We packed snacks and had a little snack picnic before heading home. It was so hot. I tried my hand at making salsa. I think it turned out pretty good. I’m anxious to see how it tastes after the flavors have gelled more. (I used Joanna Gaines recipe.) I also made some bone broth, but it was still cooking when I was snapping pictures of my food like a weirdo. We had a big storm last night. It was LOUD, but I’m really thankful for it. We now have gorgeous fall weather. My windows are open, the breeze is blowing through, and I can hear my wind chimes outside. It almost makes up for Harper dumping several packets of oatmeal on my kitchen floor. I’ve got garage sale organizing to do. I also need to find our cool weather clothes because tomorrow’s high is 67 and I hve NO IDEA where anything is.